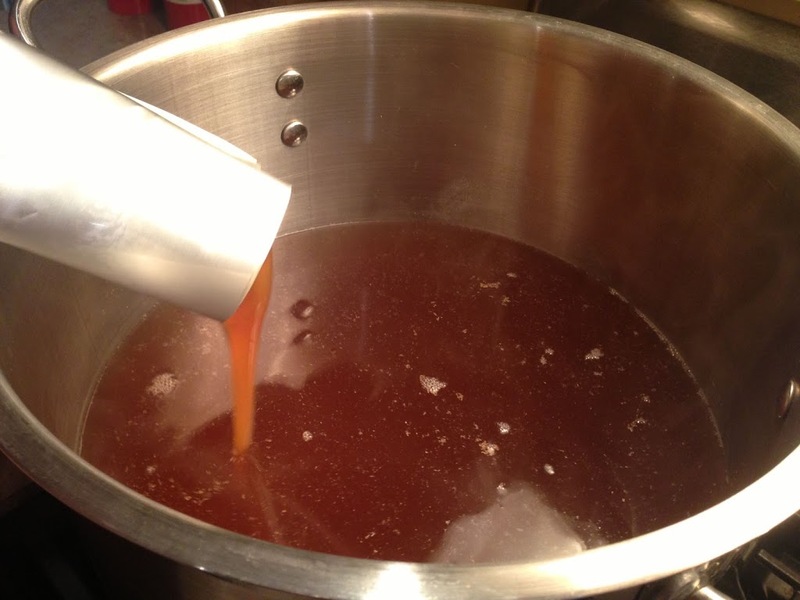 This is a step by step guide to brewing a first extract beer. This process uses More Beer’s Personal Home Brewery Kit #2 Deluxe Starter Equipment Kit. The techniques that I use here are designed to minimize the need for additional equipment and thereby reduce expenses. You can upgrade equipment and techniques when and if you’re ready to, over time. Most if not all of the equipment contained in this starter equipment kit can continue to be used as your brewing evolves. 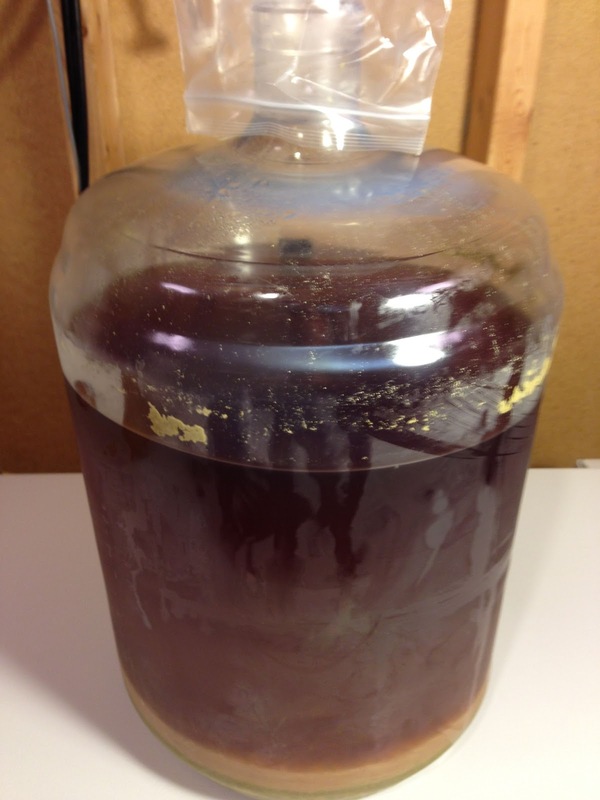 I use More Beer’s included Extract Brewing Instructions as an outline for this post. Step numbers can be crossed referenced against those instructions. When I use quotes on step directions, those are direct quotes from the directions. 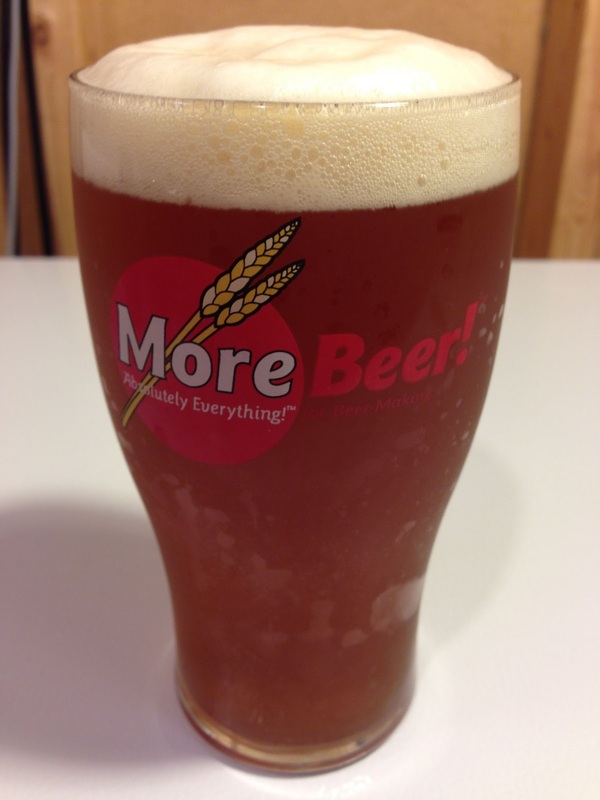 I brewed More Beer’s Zythos IPA kit (KIT163) for this post. Guys… In case you wondered, the box does not contain alcohol! A nice welcome to Home Brewing Guide greets you upon opening the box. Welcome guys! A kettle that will boil a minimum of 3 gallons. Usually a 5 gallon (20 qt) kettle is the minimum. 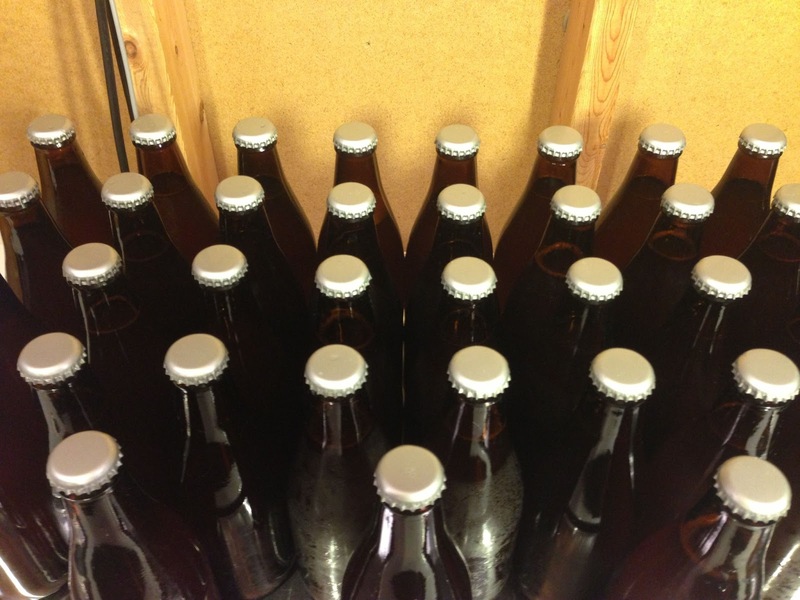 Approximately (48)12 oz or (24) 22 oz non-twist, pry-off style beer bottles. Re-usable nylon mesh bags for steeping grain and hops. 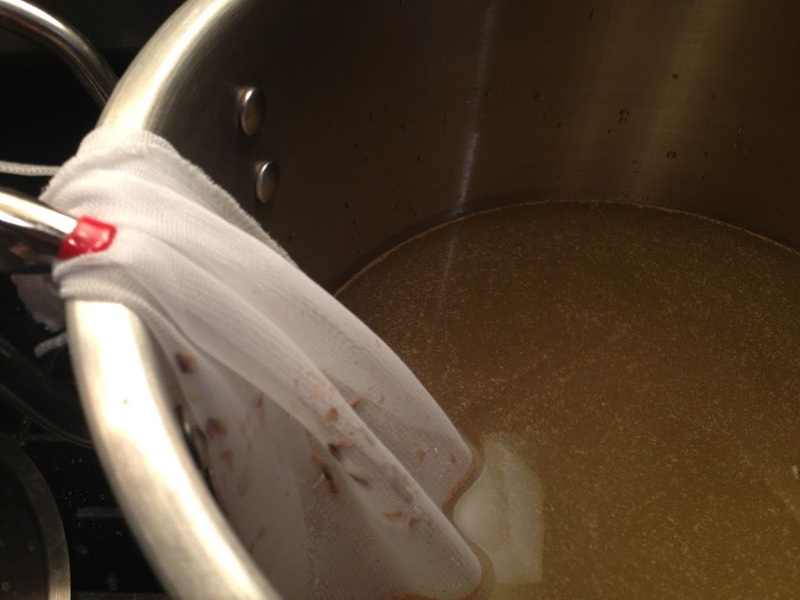 1 Day Before If you are using liquid yeast, take the yeast out of the refrigerator. If you’re using a Wyeast Smack Pack. Smack the pack when you take it out. Mark 5 Gallons: I used the included fermometer strip to mark the 5 gallon line. The top of that strip is the 5 gallon mark. You can also use a permanent marker. This line will be used to help hit your final volume. Final volume is a key factor in hitting your intended Original Gravity. You only have to complete this step one time. 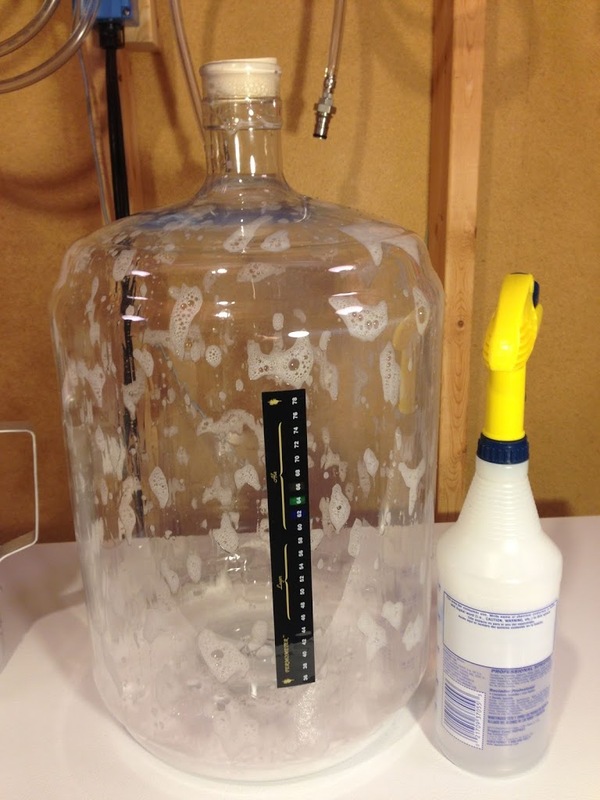 Sanitizing your fermenter: The included directions say to add 1 oz of sanitizer and fill the fermenter the rest the way to sanitize. I’m going to diverge with the official directions here. If you use a full 1 ounce of Star San, this bottle will last you for four brews. 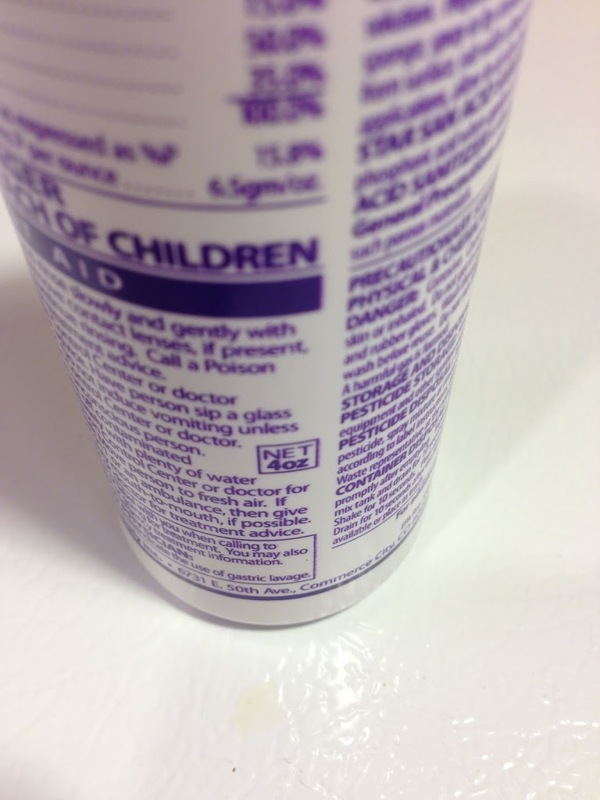 A much more efficient and arguably easier method is to use the Spray Bottle Method. 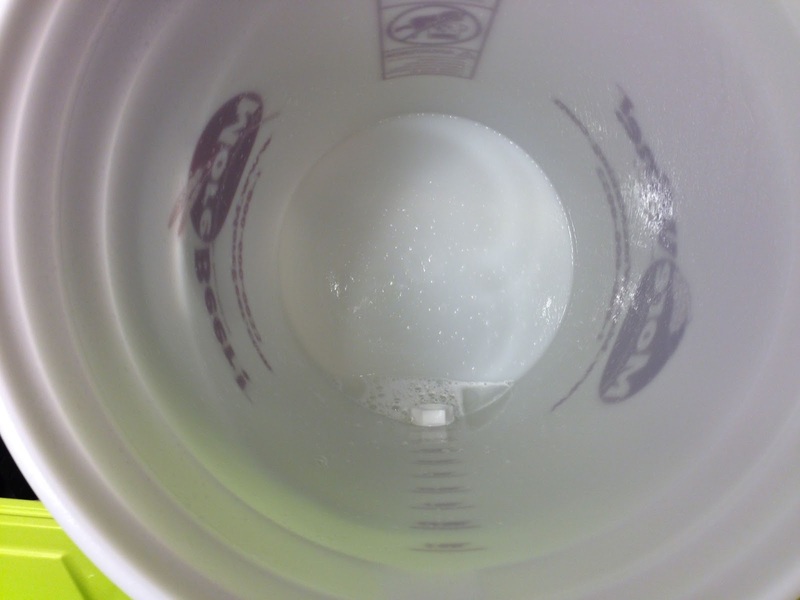 The crux of that is: Add 6 mL of Star to 1 Gallon of Distilled Water. Fill a Spray Bottle with that. Use the Spray Bottle to coat items in need of sanitization. 4 Ounces is about 118 mL. That’s 29.5 gallons of sanitizer using the Spray Bottle Method. Let’s say you use 1/4 gallon per batch, which is probably high, this one 4 oz bottle will last for 118 batches. 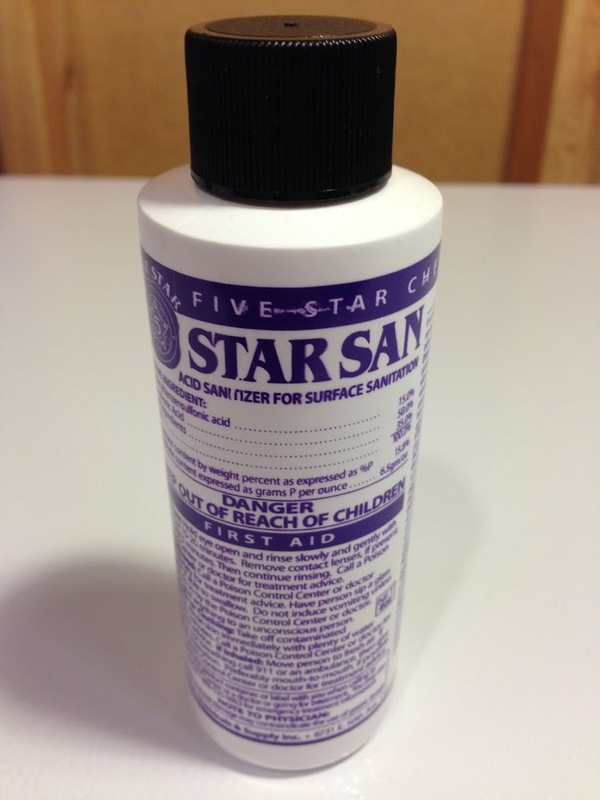 If you’re going to use the Spray Bottle method… empty the five gallons of water and thoroughly soak with Star San using a Spray Bottle. Drain any excess Star San. Place the stopper or a piece of aluminum foil on the opening to minimize air getting back in. 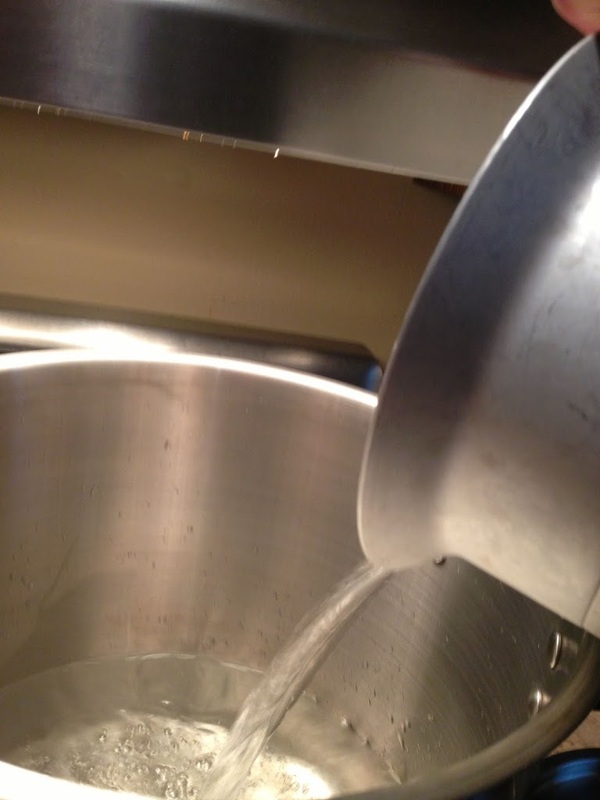 Note: You can sanitize the fermenter, and other items, much later in the brew day. I include it here only because the directions combine this step and the 5 gallon marking step. I used a 6 gallon kettle for this beer. You can use anything that holds at least 5 gallons. Maybe you have a big spaghetti or chili pot that fits the bill. Either way, make sure to leave some space at the top. 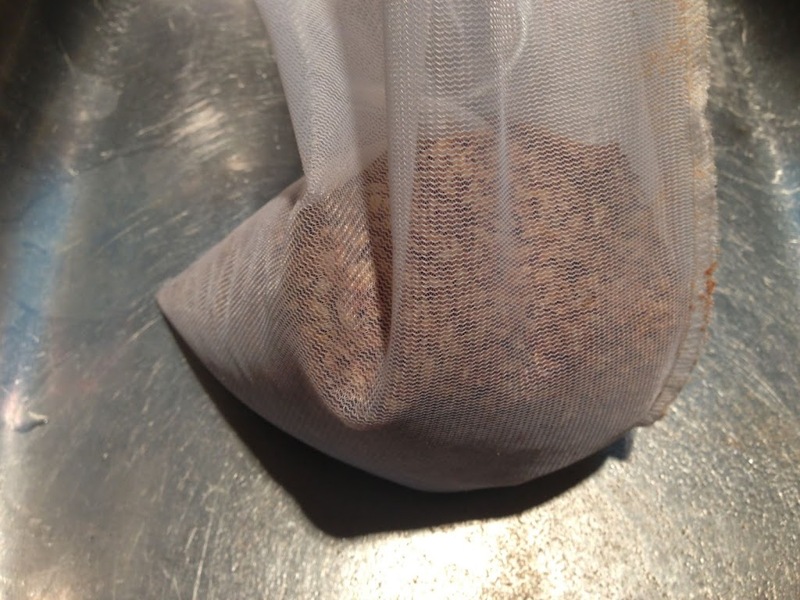 Here are the specialty grains in the included mesh bag. Just in the water. I used a clamp to secure the bag to the side of the kettle. 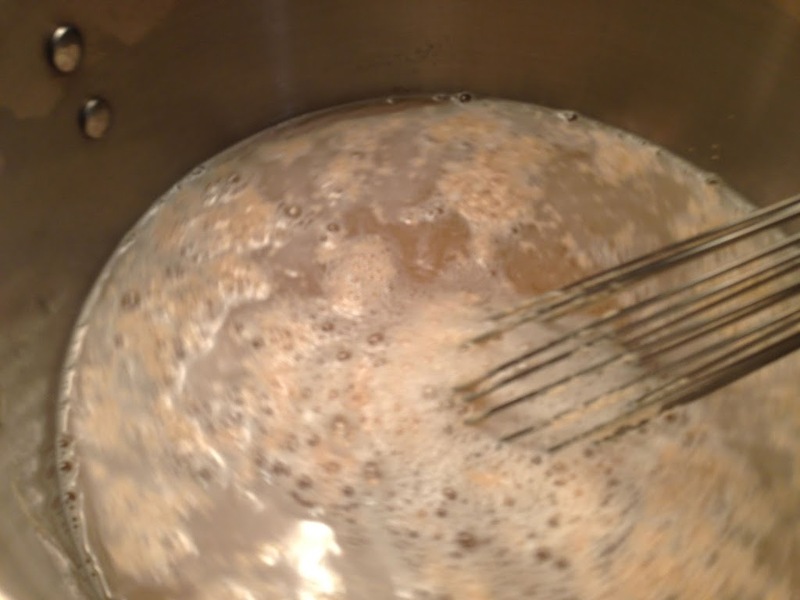 Adding Liquid Malt Extract (LME) from the Zythos IPA Kit. The picture doesn’t show it, but to avoid scorching, make sure and remove your kettle from the heat and continuously stir. Incorporating LME. This kit does include a nice large stainless spoon that will work well for this. 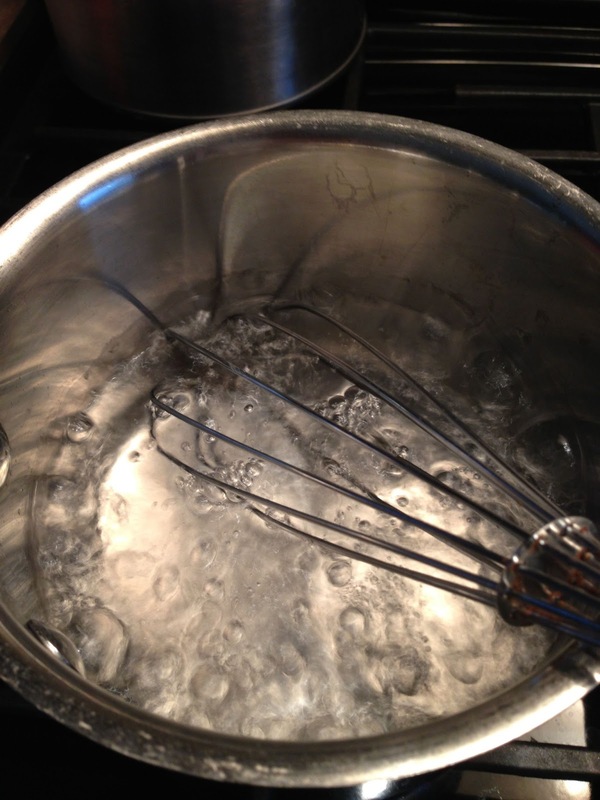 I just couldn’t resist using my 24″ whisk. 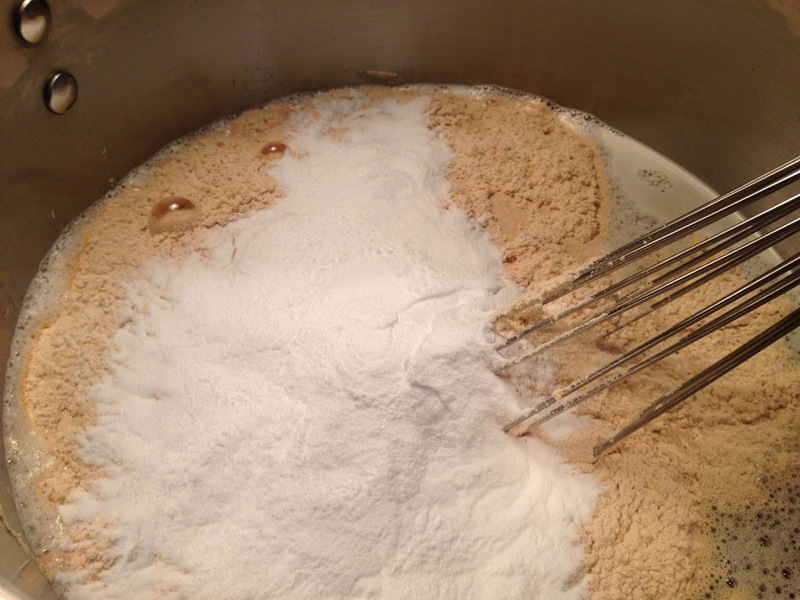 This recipe calls for some additional Dry Malt Extract (DME) and Maltodextrin They have just been added in this picture. Hey, remember in the directions where it says “you will notice foam starting to rise”. Yeah, here’s that happening. You don’t want this to boil over. Ask me how I know. 🙁 Tips: 1. Reduce heat, 2. Stir the foam. 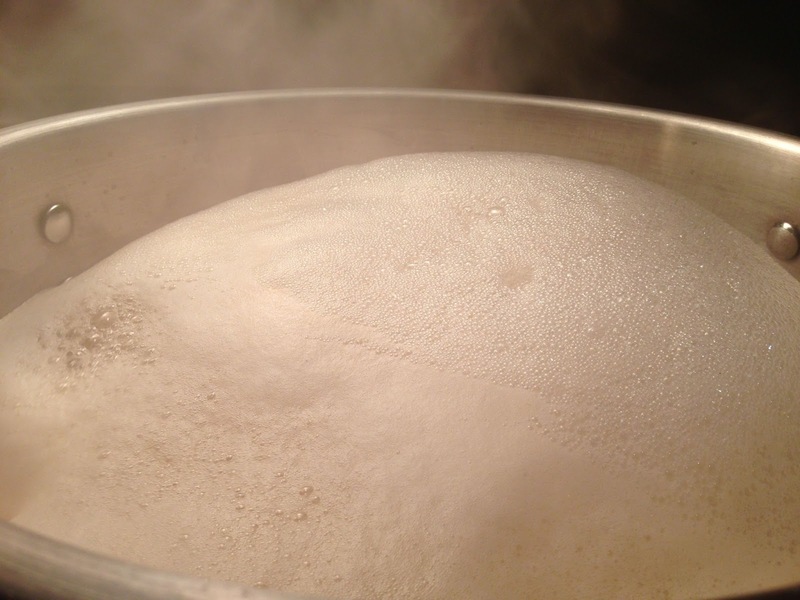 You don’t need to stir the whole thing, just stir the foam to break up bubbles. That’s easier, faster and more effective than trying to stir the whole mass. This is going to be recipe specific. Most recipes do call for a 60 minute hop addition. 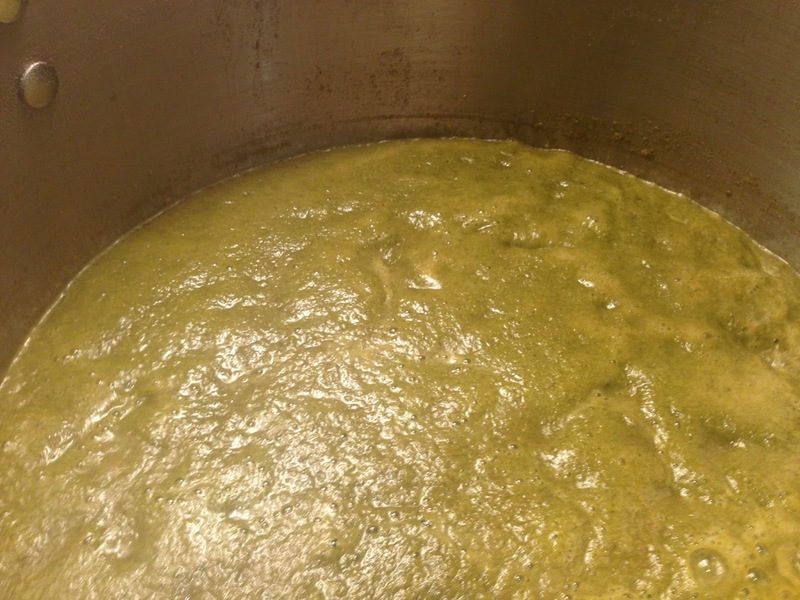 60 minute hops added. Sometime’s you’ll get a bit of a hop break when you add hops. Something to keep in mind if you’re using a kettle that’s really tight on space. 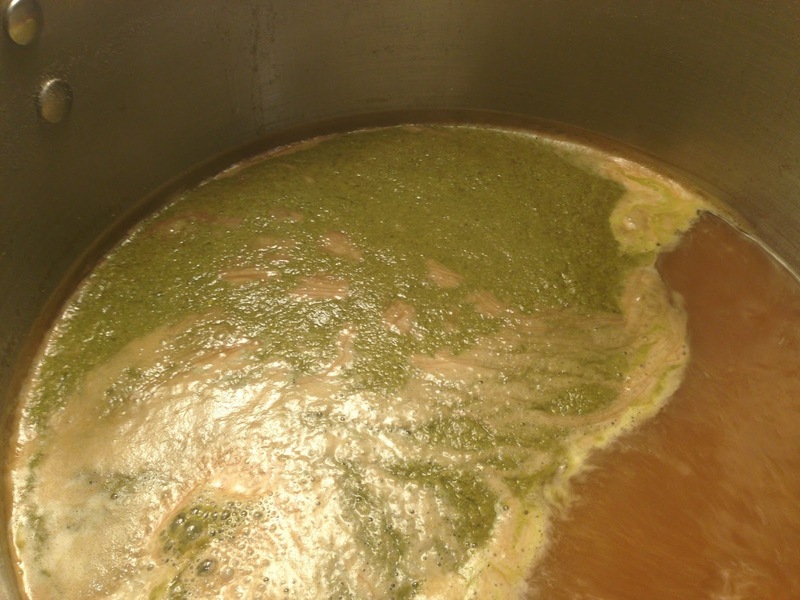 In all More Beer’s Zythos IPA Kit has four additions – 60 minutes, 20 minutes, 5 minutes and 1 minute. One of the later additions is pictured above. 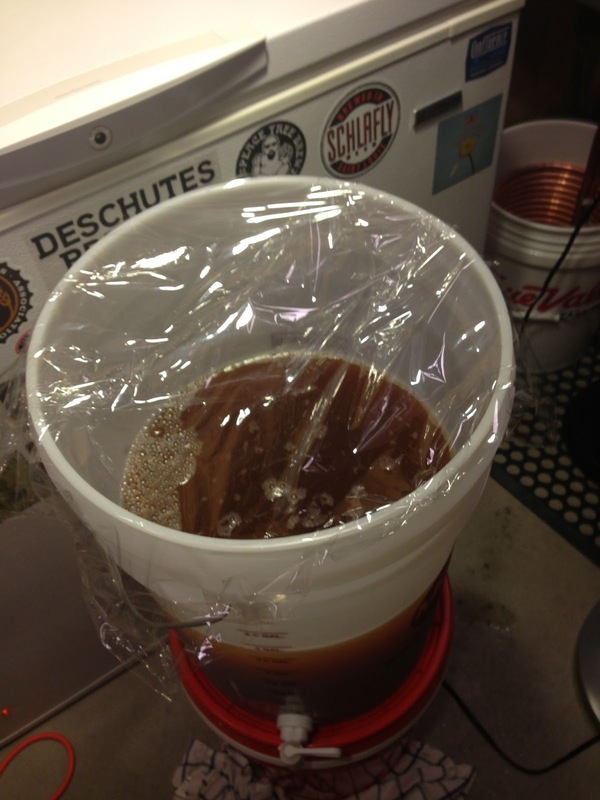 Anything that touches your beer after it has cooled needs to be sanitized. 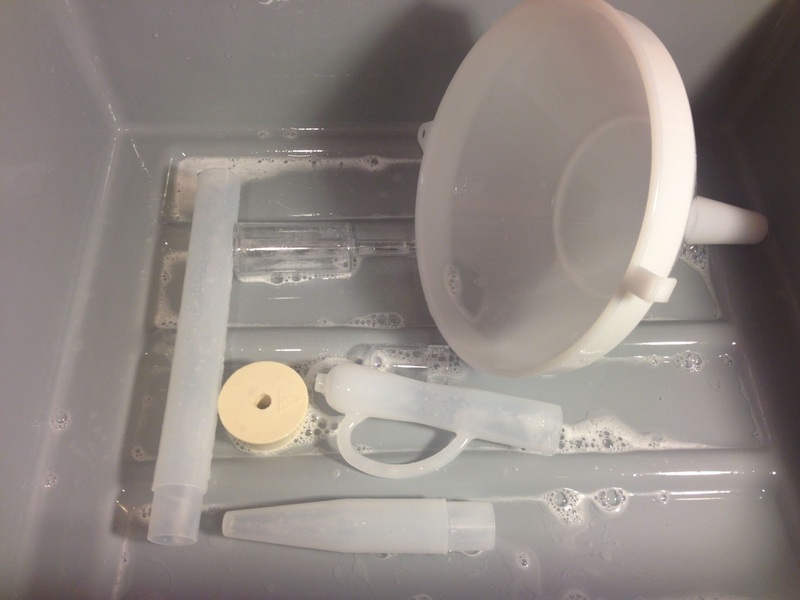 I found it necessary to sanitize: The included funnel, airlock, stopper and the sample taker (wine/beer thief). The fermenter was already sanitized in step 1. 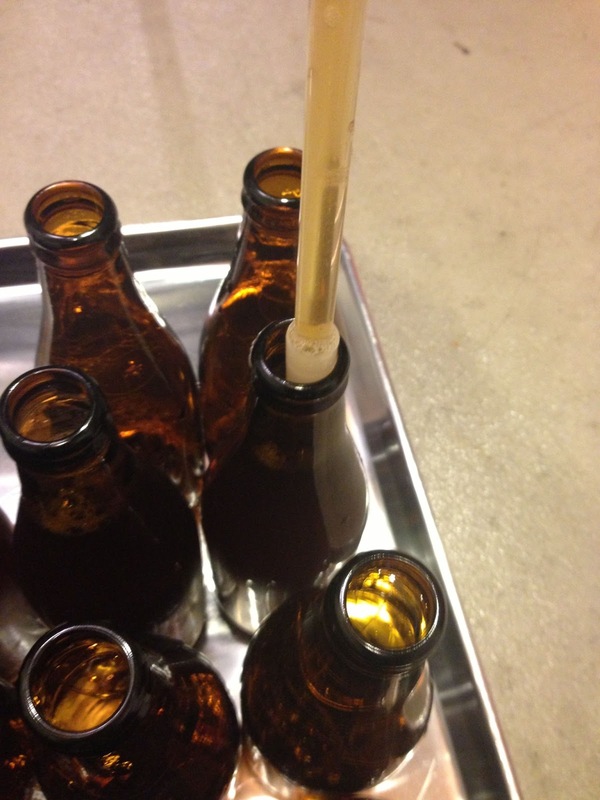 Not pictured: You’re going to want to sanitize the thermometer before you use to to check chilled wort temperature. I skipped this as these directions assume you do not have a wort chiller. 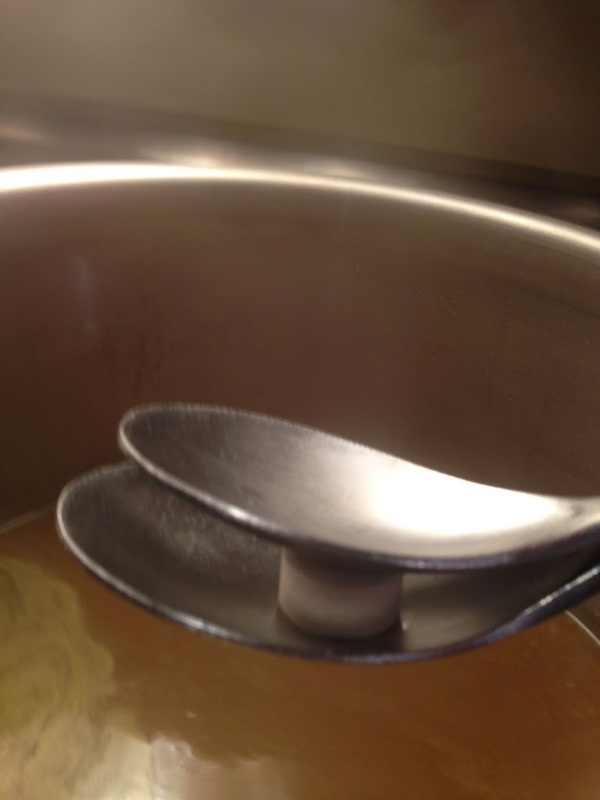 I put Whirlfloc tablets between two spoons and crush them right over the boil kettle. 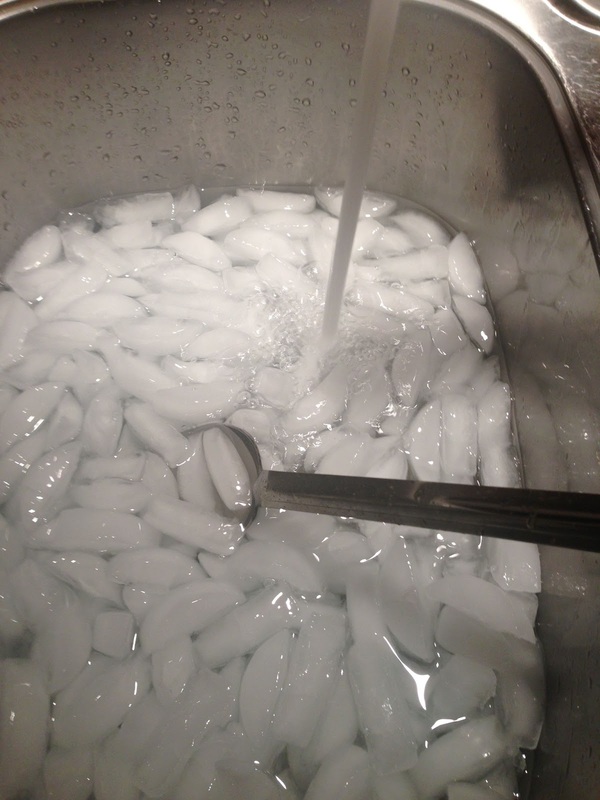 I then use those spoons to mix it in. Whirfloc causes proteins to coagulate and fall out of suspension. Keep an eye on our kettle as this usually causes some foaming. The final 1 minute, 2 ounce addition of Zythos pellets. 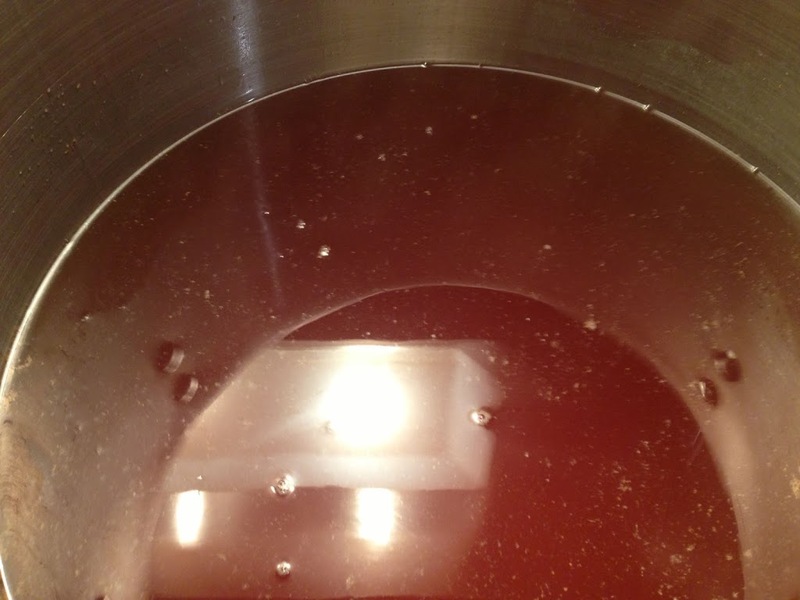 Step 11: Cooling Wort (for partial boils). The directions basically have you chilling in an ice water bath in your sink until you get down to 130 deg F and then draining this into a fermenter filled with ice water. Read the directions for more information on that. I took a slightly different approach. 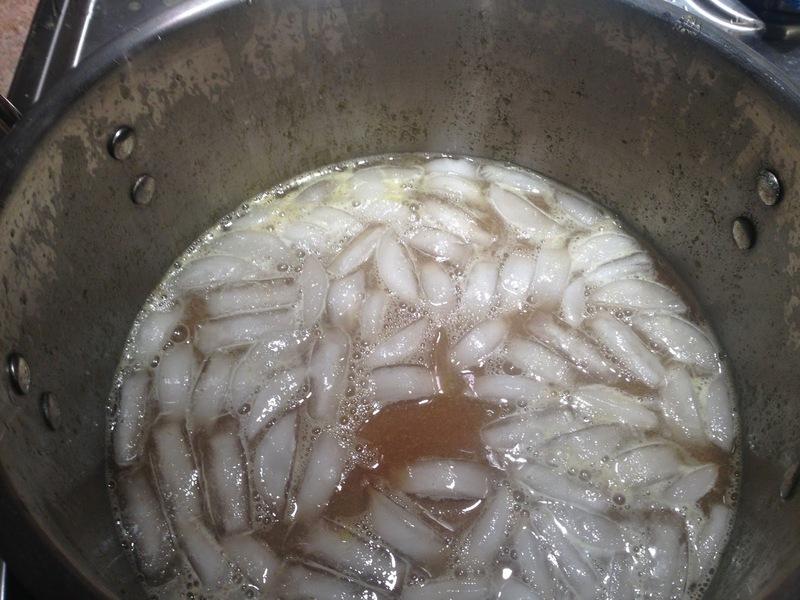 I added about 2 quarts of ice cubes directly to the kettle (be careful for hot splashing wort!). This brings the temp down a fair bit, quickly. 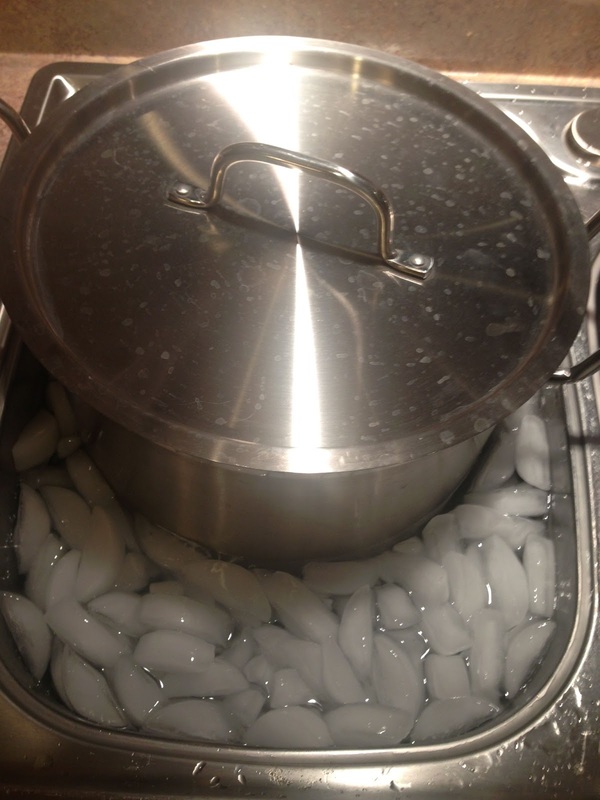 Kettle in ice bath. 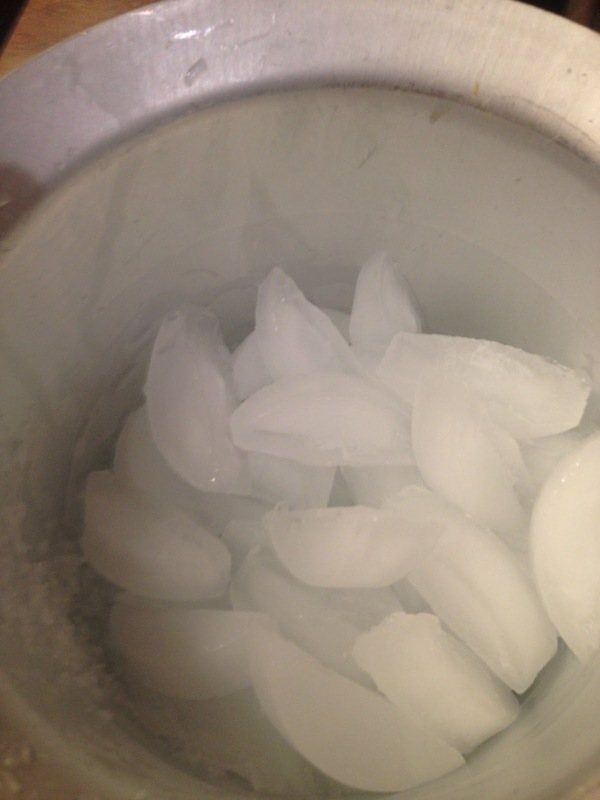 Leave the lid on your kettle while chilling. I periodically spin or otherwise agitate the kettle to speed up the cooling process. 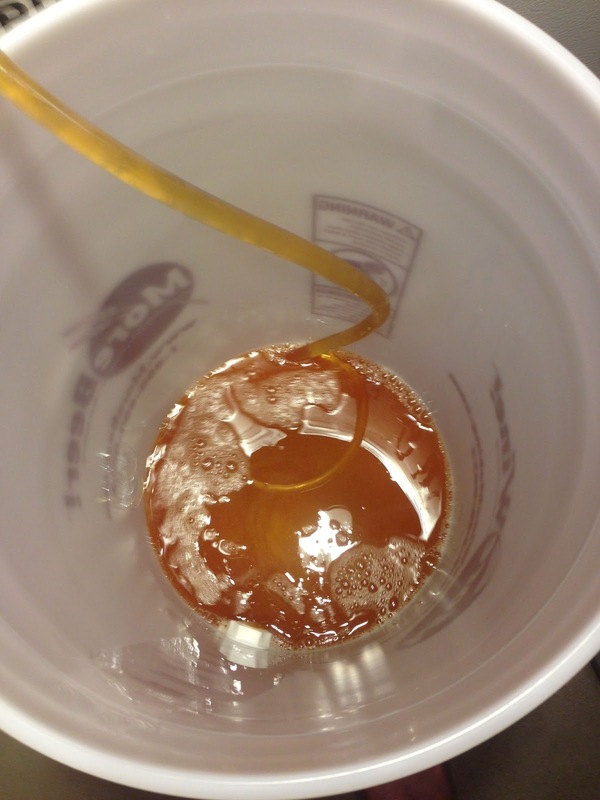 When the wort is chilled to between 70 and 80 degrees carefully pour it into the fermenter using the included funnel. Top up as required to achieve a total volume of 5 gallons. 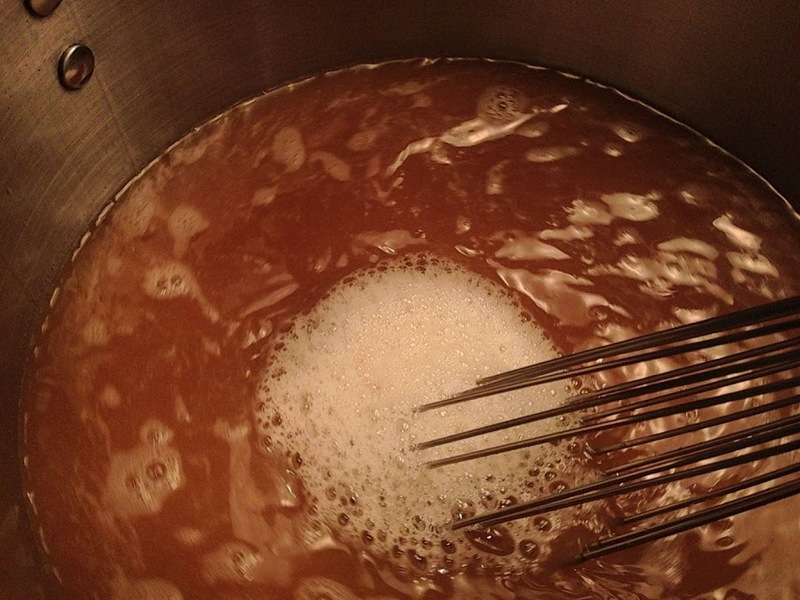 Step 12: These instructions are for chilling wort when doing a full boil. I skipped this step. I ordered Safale US-05 dry yeast along with this kit. 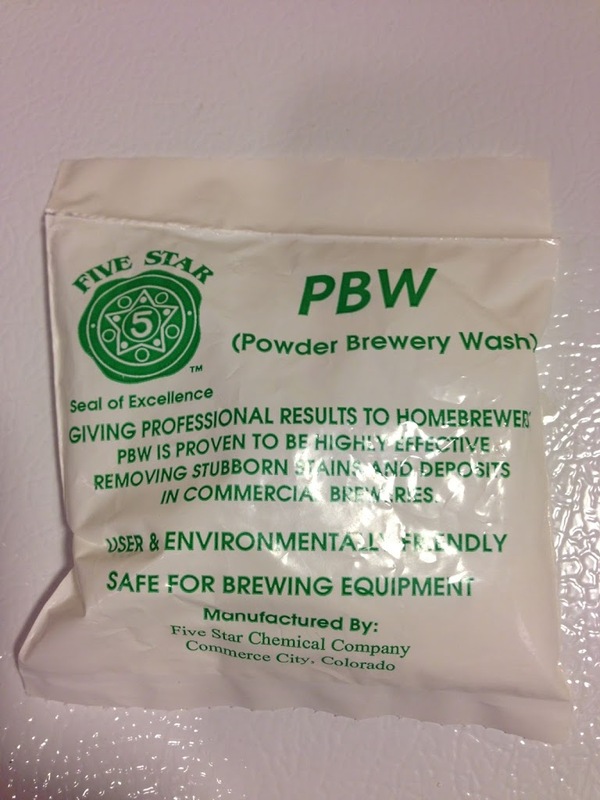 I typically do rehydrate dry yeast, but I did not for this beer. 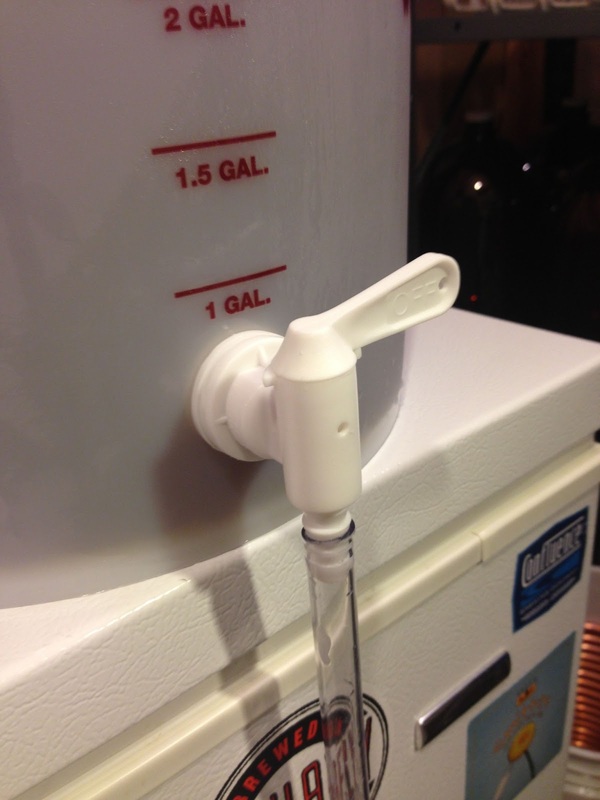 Find a temperature stable place to ferment your beer. Places to consider: Basement, Closet, Bathroom Tub or a tub filled with water. 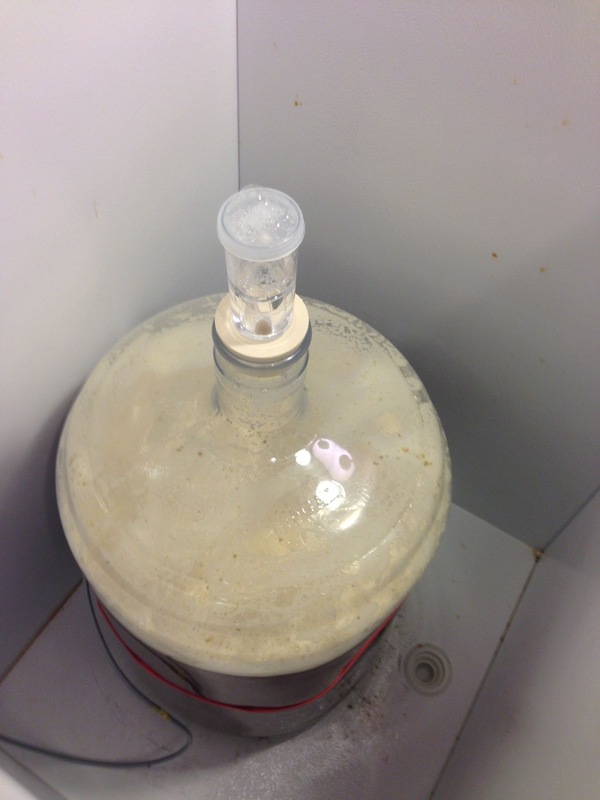 I placed mine in my temp controller fermentation deep freeze. 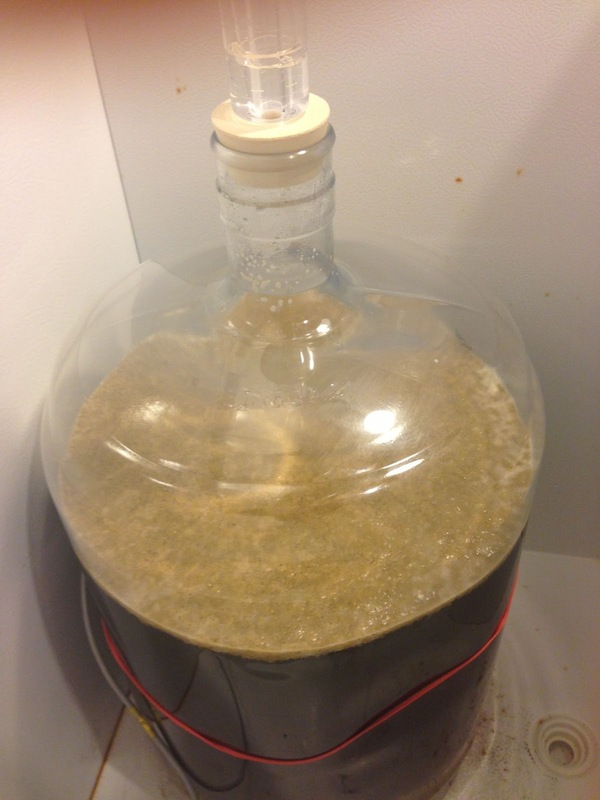 Fermentation is up and going within 24 hours or so. Here’s the beer 3 days after pitching. Here’s the beer 5 days after pitching. 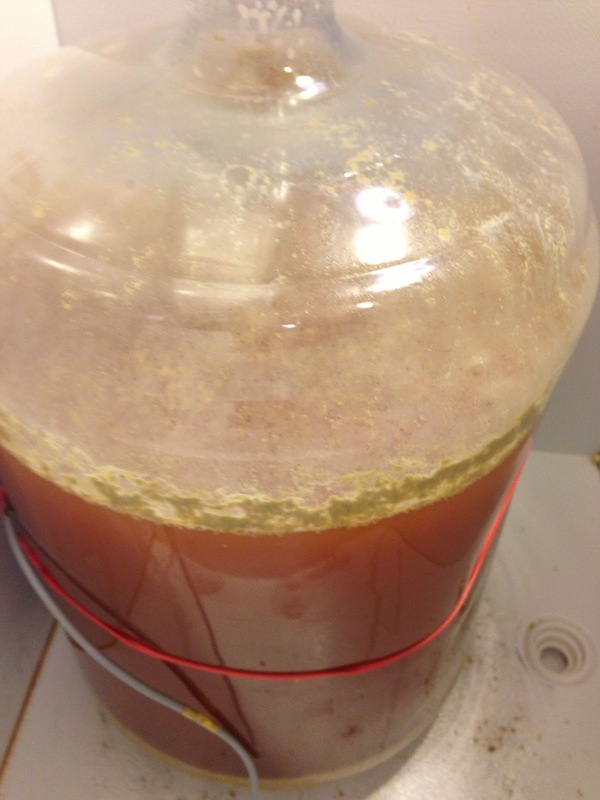 Fermentation has slowed noticeably. 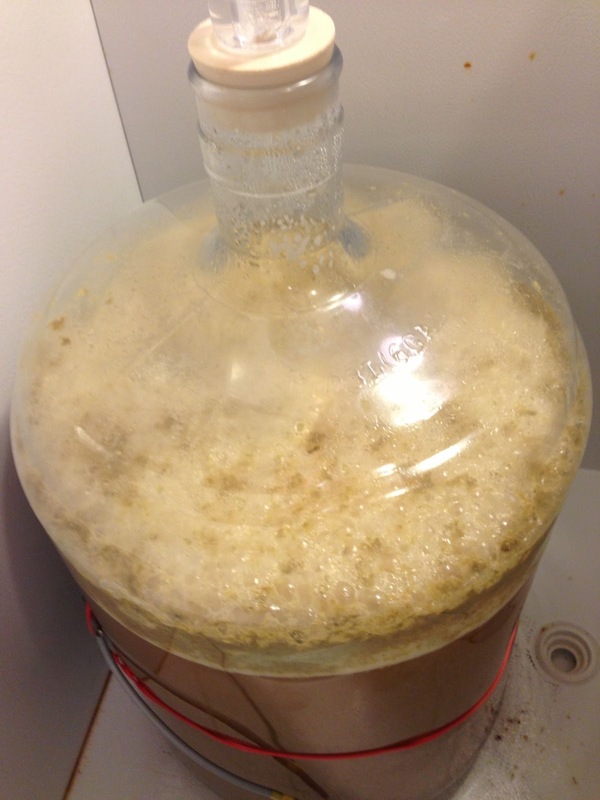 Airlock activity has markedly slowed down, the krausen/foam has dropped and the beer is starting to clear. I soak bottles in a hot mixture of PBW solution. That does a great job of removing labels and also cleans the inside. These bottles already had the labels removed. I rinse the outside off with tap water and then rinse the inside out with a jet sprayer. 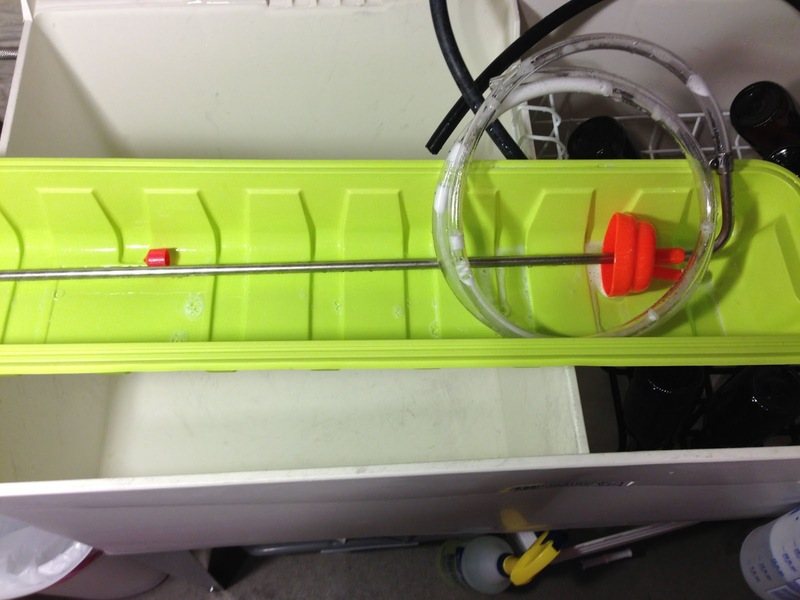 This equipment includes More Beer’s Sterile Siphoning Kit. 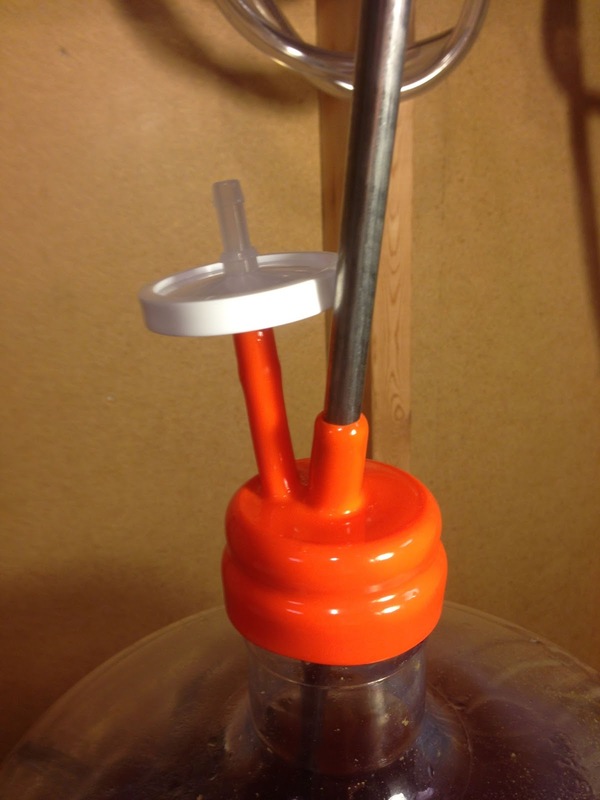 This allows you to easily create a siphon. Sanitize all components (except the sterile filter). 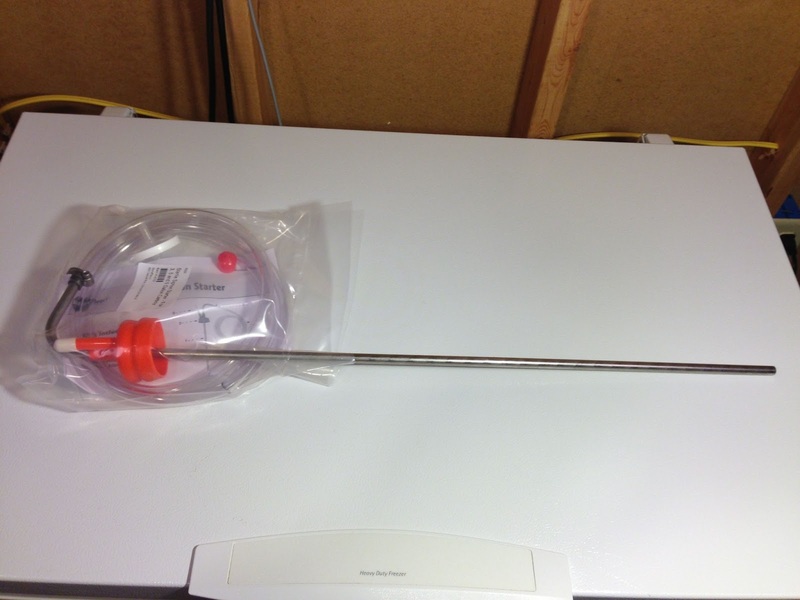 Assemble the tubing and racking cane, Insert that through the carboy hood and place the racking cane tip on the end of the racking cane. Place that in the fermenter. 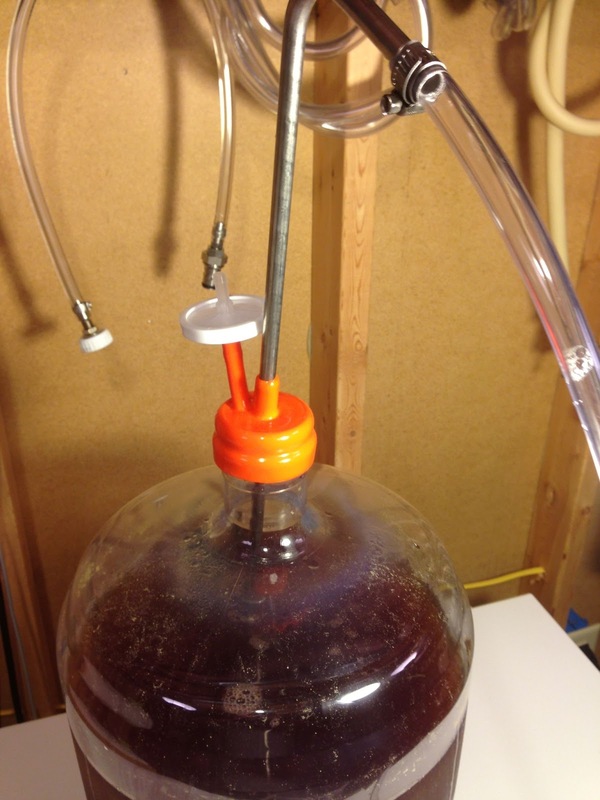 Put the sterile filter in the remaining carboy hood hole. 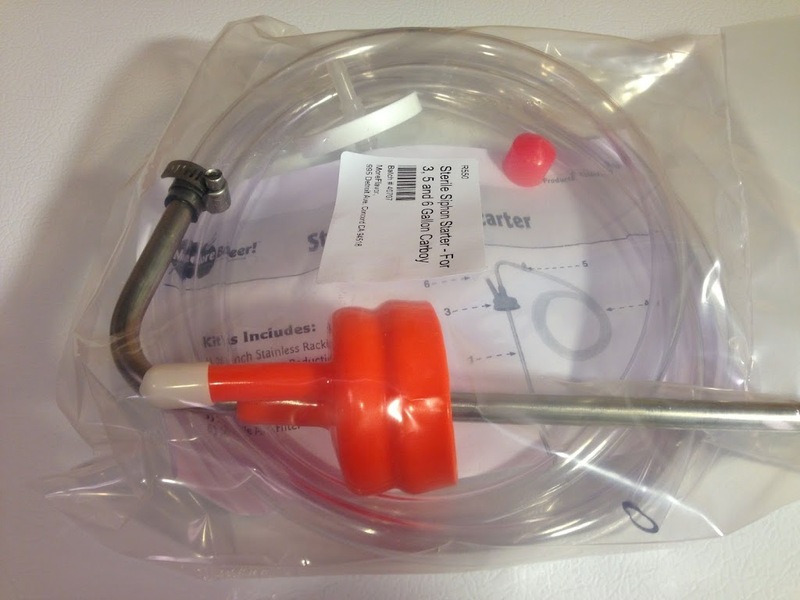 To start a siphon simply blow in the sterile filter. 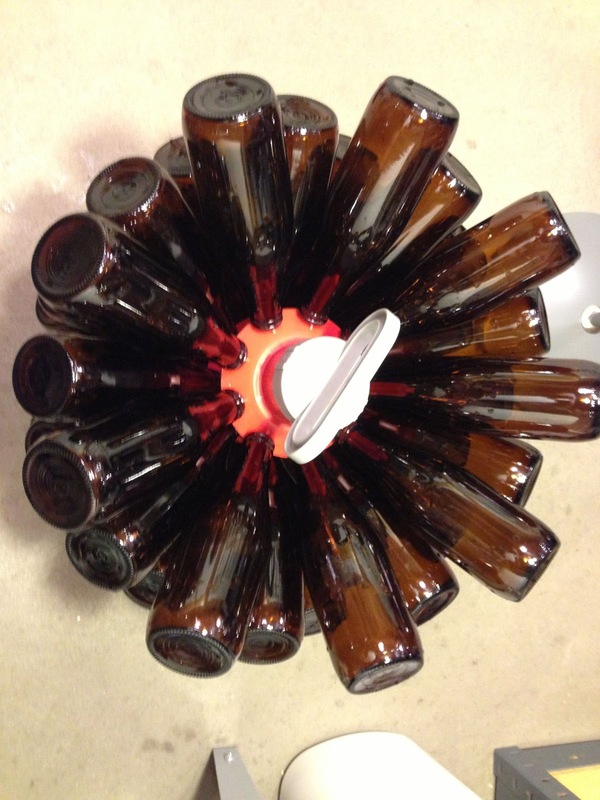 Situate the bucket and tubing so that the tubing is all the way at the bottom of the bottling bucket. Less splashing equals less oxygen pickup. 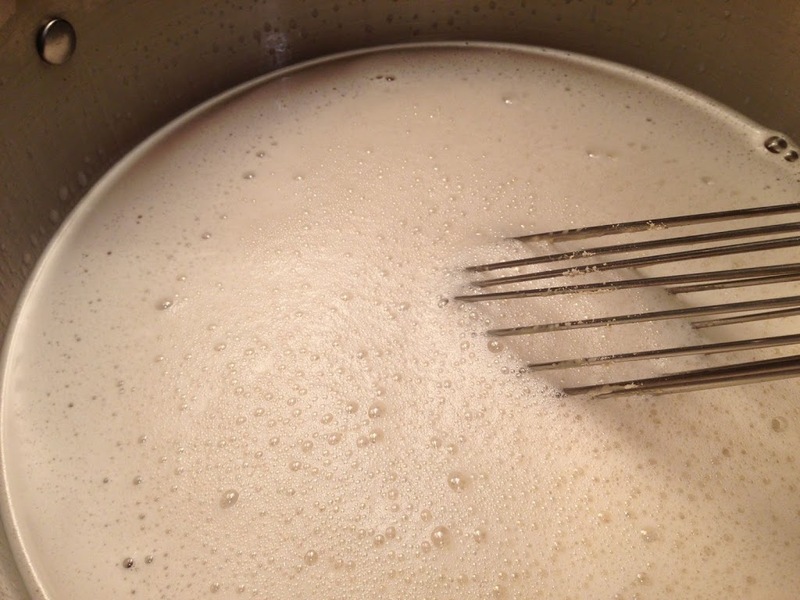 Per More Beer’s directions, pour in the boiled priming sugar solution when you get two inches of beer in the bottling bucket. I use a full size sheet pan to catch drips while bottling. I sanitize bottles by spraying a couple squirts of Star San in each bottle and inverting to drain that solution out. Also make sure to sanitize bottle caps. Tubing connected to bottling bucket. 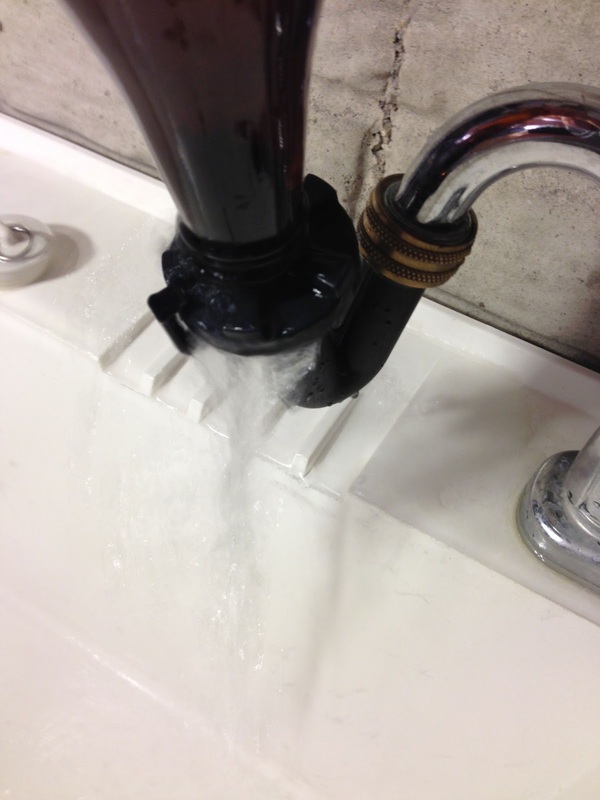 The included spigot includes handy On and Off labeling. 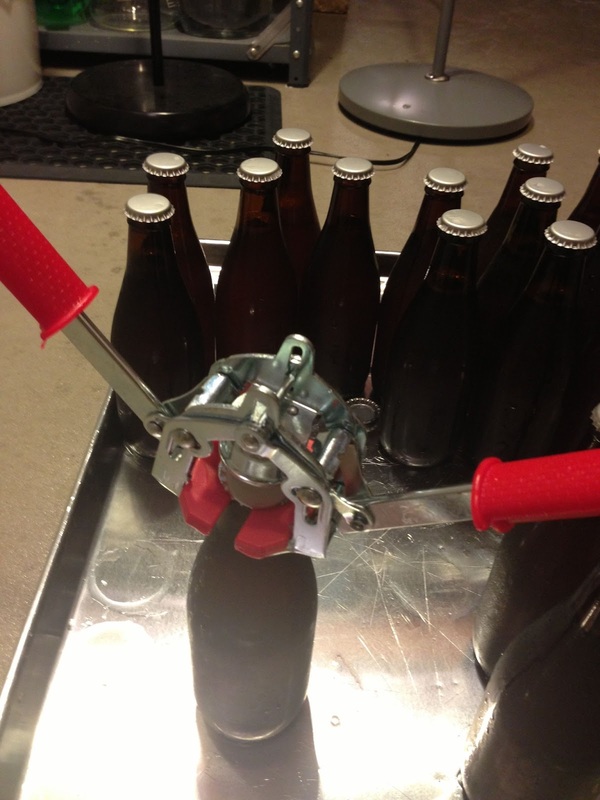 Sanitized bottling wand on the other end of the sanitized tubing. 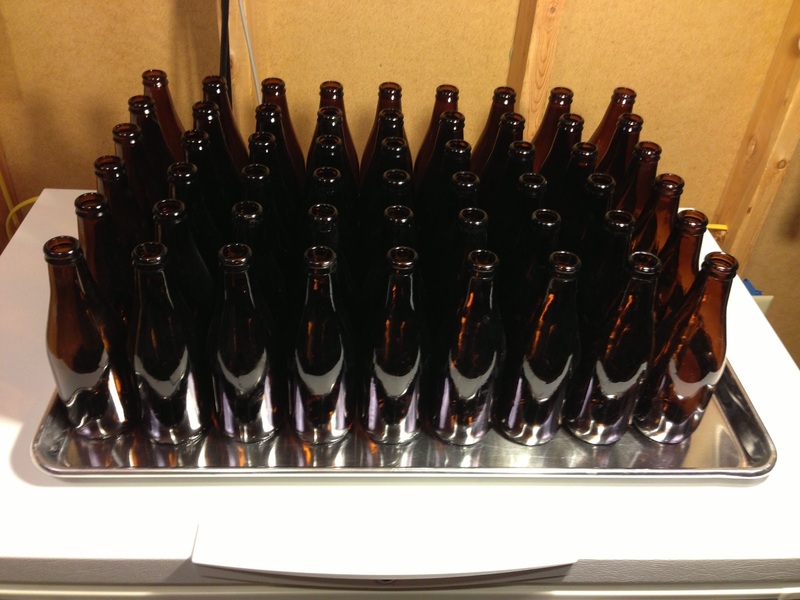 Starting to fill bottles. As I fill bottles, I place a sanitized cap on each one. That reduces airborne bacteria while at the same time allowing me to continuing to fill bottles. 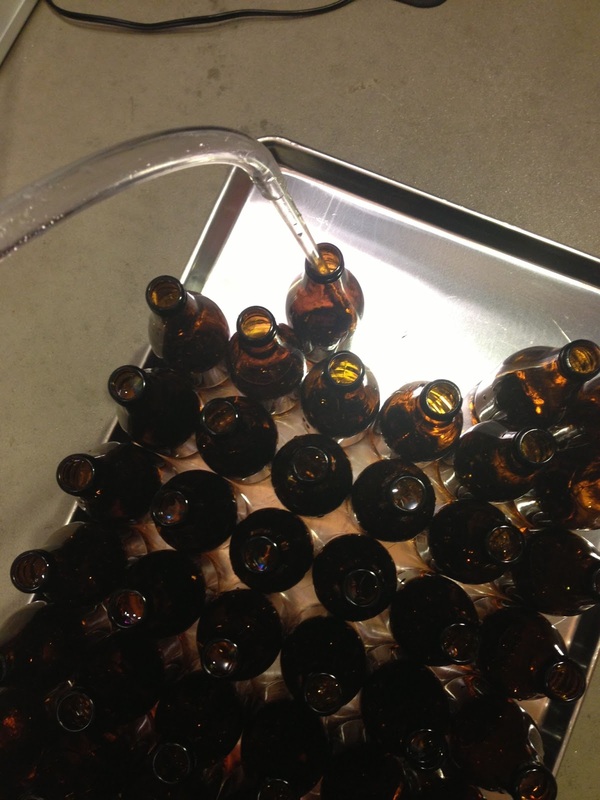 I rinse off the bottles to get any drips of beer off of them and then give them a quick dry. Here are some of the filled bottles. This Zythos IPA was brewed using relatively simple techniques, in my kitchen. It fermented in my basement. It tastes delicious. If someone handed this to me and said it was such and such from such and such brewery, I would say… that’s a great beer. 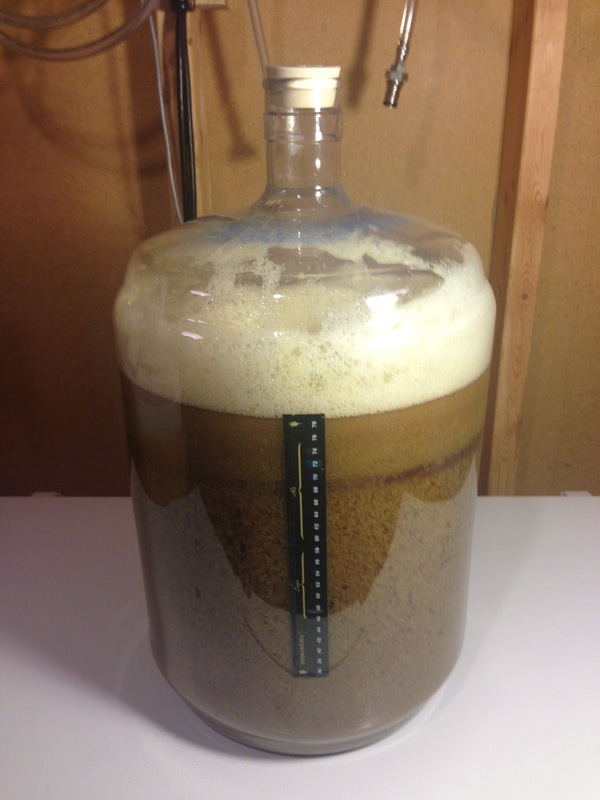 Homebrewing is a hobby that can grow with you. You can start out with this or a similar kit and much of the equipment can continue to be used if decide to take a next step. This is a great starter kit with nearly everything you need to get started. My Perfect Beaker shows this packet coming in at about 2 ounces. What is 2 ounces of PBW good for? It does little more than prove that PBW exists. 🙂 Seriously though. 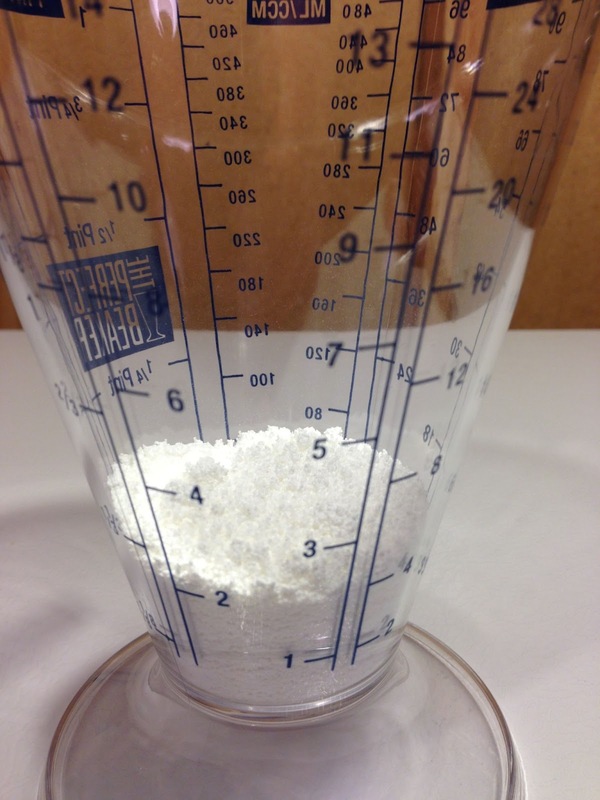 While the supplied amount of Star San may very well last for years using the Spray Bottle technique, the included amount of PBW isn’t enough to complete your first batch. Add a 1 lb or preferably a 4 lb container on to your order or plan on cleaning with some other substance. Saves time and water when you’re cleaning bottles. 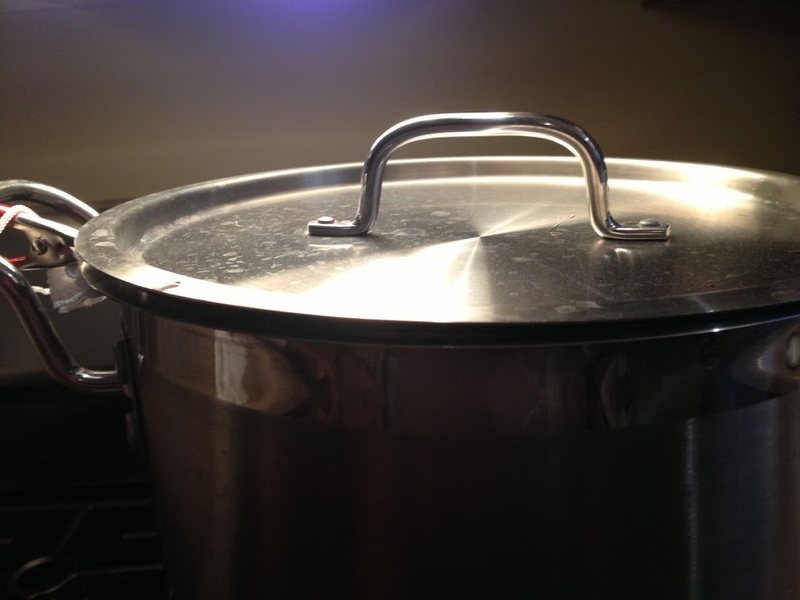 If you do not have a large enough kettle on hand More Beer offers an economical 5 gallon stainless kettle. This works really well for incorporating LME and DME. It also works really well as a mash tun whisk should you choose to start brewing all grain in the future. 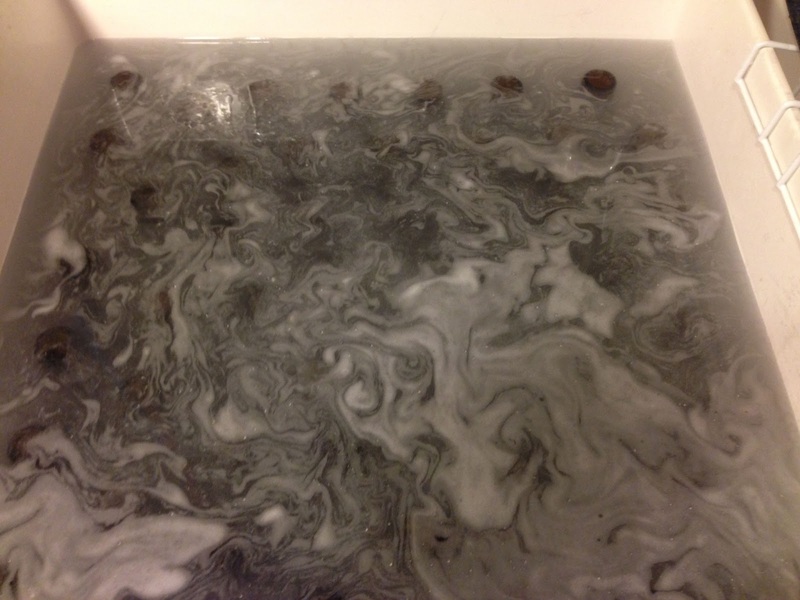 It’s also great for starting a whirlpool. 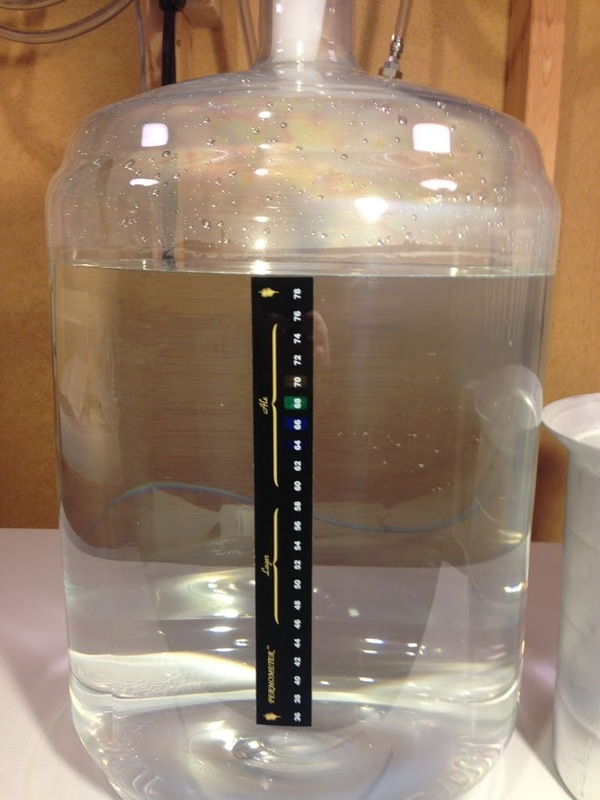 Consider picking up a quality 1 gallon pitcher for measuring water. 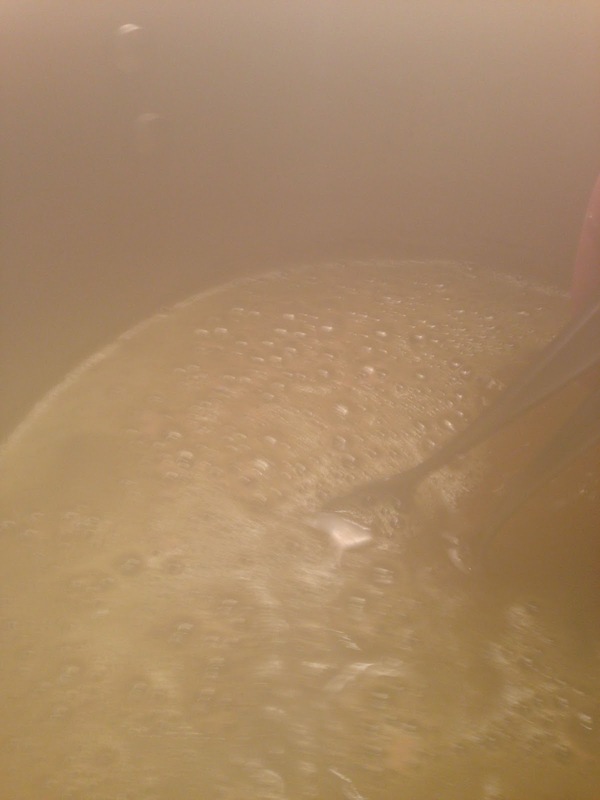 Full Wort Boils: At some point consider doing full wort boils. That requires a larger kettle, this one is a great value. That upgrade also, generally requires a wort chiller and can possibly require a propane burner. 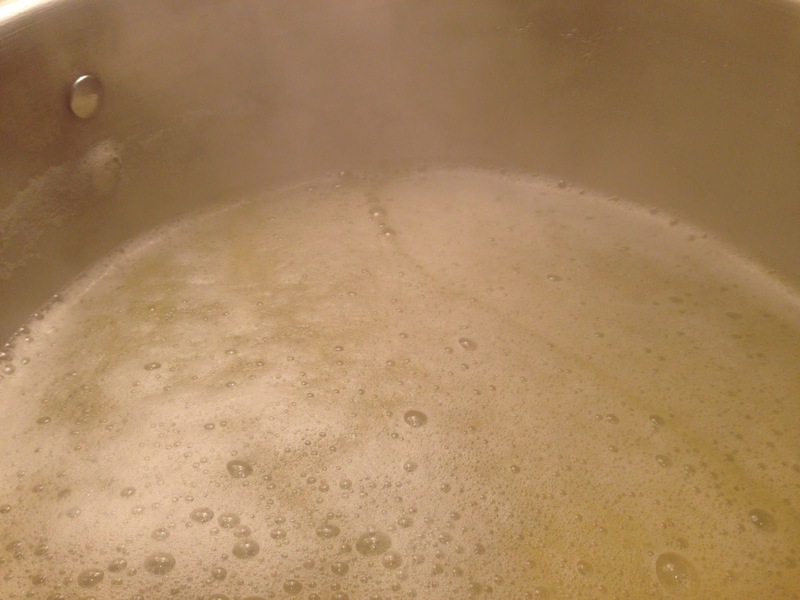 This entry was posted in Equipment Kits, Extract Brewing, More Beer, New Brewers, Reviews, Reviews & Top Posts, Top Posts on June 17, 2013 by admin.